Can't get your forearms and calves to grow? Try using these advanced pairings of the Weider Principles to shake things up for new results. When it comes to smaller muscle groups like your calves and forearms, sometimes, straight sets aren't enough. For these pump-prone but growth-restrictive muscles, you usually need to go above and beyond the norm to elicit serious gains. The Weider Principles may be the answer. These tenets, made famous by our founder Joe Weider, help bodybuilders inject more intensity into their workouts. But when these techniques are paired with others, however, your body is truly pushed to the limit. Here, you'll find two sinister pairings aimed at helping you build bigger forearms and calves. 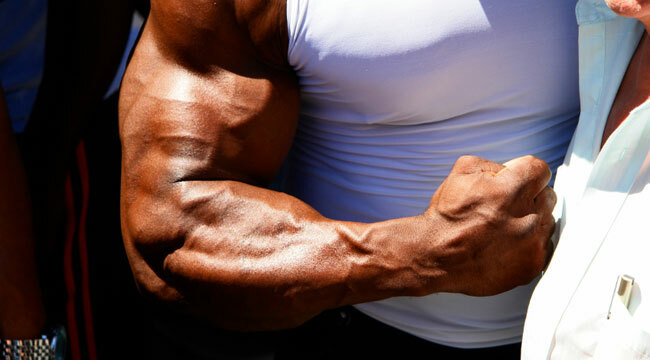 Wrist curls and wrist extensions are two of the best ways to build forearm mass. But you can get much more out of these exercises by simply boosting the intensity of these dedicated workouts. Here, we pair two techniques that will leave no muscle fiber behind. Supersets: Perform sets of two exercises for the same or different muscle groups back-to-back with no rest in between. Burns: Continue a set past the point at which you can lift a weight through a full or even partial range of motion with a series of rapid partial reps. Do this as long as your muscles can move the weight, even if only a few inches. *Perform burn reps to failure after reaching 12 reps.
Load a barbell, or barbells, with your 12RM for wrist curls and extensions, being careful to select a weight for each that brings about muscle failure at 12 reps. After completing a set of 12 wrist curls, immediately flip your grip and start a set of wrist extensions. Repeat this sequence three more times, resting 60-90 seconds between each superset. On the fourth and final superset, once you can no longer complete a full rep of the wrist curl with good form, begin pumping through as many short, or partial reps as you can before switching to wrist extensions and repeating the process.